Companies today are faced with the challenge to expand their brand reach across market segments and differentiate themselves. A company’s commitment to social values and causes is one of the top reasons consumers choose one product over another. 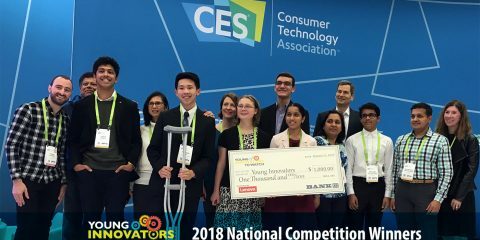 By aligning your brand with the Young Innovators to Watch you not only support this “give back” initiative, but also reach thousands of participants at CE Week in NYC. Includes logo on website, on trophies, signage at audience presentation, step and repeat photo opps, personal company thank you speech at the award presentation, company written commendation to the winner's, social media campaign, press outreach, and photo opps. PLUS join students and camera crew as they tour CEWeek for great exposure! Your company logo on caps the students will be wearing throughout their CEWeek experience and given to Media. Your company logo on Young Innovator CEWeek Exhibit tour t-shirts. Your company logo on the bag the students carry with them at CEWeek. 10 units of a product $50 or over and placement in award bags and mention in press.